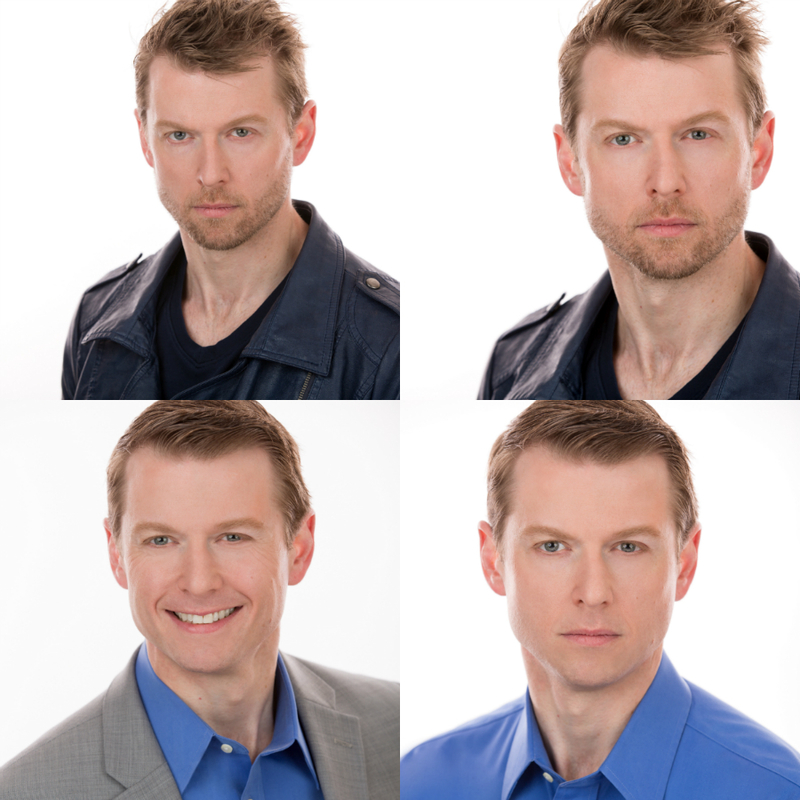 I shot the acting headshots above in the last 30 days at our North Raleigh studio. Although they are currently the first images you see on our acting headshots page, they will likely be updated overtime with other images. I'll give you an good idea of how the session above came about from the beginning through the edited images above. I think you'll find it interesting. The guy pictured above was originally a business headshot client. However, he is an amazing martial artist which has lead him to pursue a dream of doing some acting and stunt work. As you'll notice above, he has two very different looks which shows that he could play two very different roles. When he came back to me to discuss acting headshots, it was more than just scheduling a session. We met at my office weeks in advance and discussed ideas along with a timeline. Once the session was scheduled weeks out, I put him in touch with Kate Leser (The Makeover Expert) who works with many of my clients for makeup and wardrobe consulting. Kate and the client planned well in advance of the photoshoot. Her fees for an acting shoot start between $100 to $150 (subject to change) for the full 90 minute session which includes 30 minutes prior to the shoot time working with her one-on-one. For the top two images, you will notice that his hair is messy and he has facial hair. He shaved in between wardrobe changes which yielded the two images in the blue shirt that were taken only minutes later. This is a great way for a man to quickly get two different looks. However, ladies can do the same thing by changing outfits and changing their hair. It just may take a little longer. I ended up shooting over 400 images in 90 minutes which included multiple variations of his clothing. All shots were done on a white background which is usually the best single option to go with unless the subject needs something more dramatic and dark that may be considered theatrical headshots. This package is ONLY $295 which is less than $50 per final image. Each additional image beyond the base of 6 is only $50 each. In addition, if you pay in full within 24 hours of scheduling the session, you’ll get a 7th image for FREE making this an even better offer.